New Zealand design brand Resident has created up a pop-up store in Manhattan to showcase its hanging hooped lights alongside other new furnishings. Located in the Nolita neighbourhood, the showroom features a series of furniture pieces from the brand, including new items unveiled alongside older designs. The 3,000-square-foot (279-square-metre) gallery space was created by New Zealand interior designer Rufus Knight, with exposed brick walls and pops of red carpeting. Displayed behind floor-to-ceiling windows along the storefront are two chairs alongside by Resident's Circus Pendant light, comprising large interlocking hoops with an LED strip around each golden circle. The pair of blue upholstered chairs are part of the new collection, and have three slim black posts to support a wide seat. Nearby is the light-coloured modular Arcade Sofa, made up of interlocking units and designed by Resident co-founder Simon James in collaboration with Scott Bridgens. "I wanted something cosy and a little puffy, with a super soft back and seat cushion, but also something to provide a contrast with that," said James. "Which is why I pared down the sofa arm and gave it a slightly unusual angle with that little lip to create a very minimal armrest." 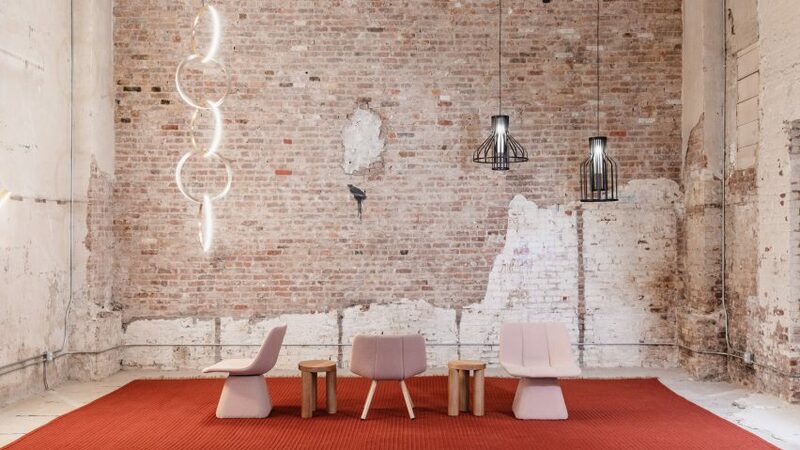 Further inside the showroom are a series of pale pink chairs, arranged on a red rug with an assortment of light fixtures overhead. A rounded glass Bloom Table light was created by London-based designer Tim Rundle. Inside the lamp, mesh filters the light from the source, before emanating through a frosted glass exterior that gives the fixture a distinct softness. "The Bloom Table light's super-elliptical form is inspired by the gentle dynamic flow of paper lanterns," said the studio. Another new light design is a black floor lamp with interlocking brushed brass rings, similar to the Circus Pendant. New Zealand firm Cheshire Architects designed a globed table lamp, the Parison Table Light, with an angular exterior and a soft, milky glow. The Resident showroom is located at 39 Spring Street, and is open from 1 to 31 May 2018. The pop-up coincides with this year's NYCxDesign festival, which runs 11-23 May 2018 and includes events, exhibitions and parties across the city.